Third Sector is the UK’s leading brand for everyone who needs to know what’s going on in the voluntary and not-for-profit sector, trusted by chief executives, trustees and senior managers in charities, voluntary organisations and social enterprises. Third Sector offers unrivaled coverage of the whole range of voluntary sector concerns. 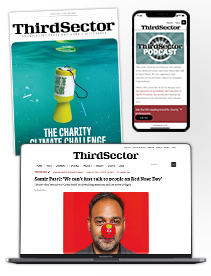 Third Sector Magazine - An informative and exclusive read, ranging from lighter articles to in-depth features and interviews with important sector figures and a range of case studies and good practice articles. Along with lively columnists and an agony uncle. Full access to our website – We offer our audience up to date news, backed up with incisive analysis and comment and respected views and opinion.